Paul tells us to “excel” in the grace of giving — that is, to exercise that muscle regularly. What are some ways you can do this through grace projects? Sell some of your stuff and give all the proceeds to those in need (This was a grace project done by the church in Acts 2:45). You could donate to the Salvation Army, your church, a local food pantry, or a missionary you know. Go to the home of an elderly or disabled person and offer to mow their lawn or wash their car — for free, of course, or it wouldn’t be grace! Go to a local charity that helps people in need but is strapped for cash — for example, a homeless services center or a disabled children’s center. Offer to volunteer with your family or small group for an entire day, doing whatever they need. Call up a local school or city. These days, every school district and municipality seems to be strapped for cash. Tell them your family, small group, or church would like to help out one Saturday doing whatever is needed — no strings attached. How can you “excel in the grace of giving” at your own house? Look around. Are there projects that need to be done? Are there daily chores with which you can help? If you need direction, ask your family members. And finally consider how you can “exercise the grace of giving” at your own church. Is your giving so comfortable that you don’t even notice it anymore, even though it was a stretch at first? Maybe it’s time to stretch yourself again. What about serving in an area of ministry? If your church is like most, it needs you! Download some songs about grace (legally of course!, see the playlist on iTunes), and then listen to them as you drive around or at work or at play as part of this immersive experience! Here are some of my favorites. Add your own ideas. Note: I enjoy an extremely broad range of musical styles, so these may not all be to your taste. But download a few, make them your daily soundtrack, and let the power of music be part of your Grace Immersion! And you answer: “ My child, I love you. 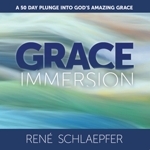 I immersed myself in a study of grace while researching and writing this “Grace Immersion” book and enjoyed every minute of it. You’ll notice I quoted liberally from several authors whose books I found thought-provoking and inspiring. If you’re interested in reading more, I hope you’ll enjoy exploring some of their volumes on this list. I don’t necessarily agree with every word written in every single one of these books, but I found them all to have points that helped me appreciate new facets of the jewel of grace! Our Sufficiency in Christ John MacArthur Jr. Here are some verses about grace that have become favorites of mine during this study. I encourage you to immerse yourself in them, memorize them, enjoy them!